Every day, it seems, there is a new technology promising to revolutionize the world. The public has been promised so many life-altering products and systems that our eyes glaze over when we see the terms “radical” or “revolutionary” in technological expositions. After all, our lives have already been rocked by the Internet and social media networks. But today a new opportunity is on the horizon—one that challenges perceptions of centralization, transparency, transactions and development. is an open-source platform that facilitates the development of next-generation decentralized applications. Ethereum was conceptualized in 2013 by Viktor Buterin, who was conducting research in the Bitcoin community at the time. Since Buterin’s initial ideation, Ethereum has blossomed into a full-fledged movement; today it is poised to overhaul open-source development. Like blockchain technology, Ethereum often gets lumped into Bitcoin discussions, and for good reason, as both share similar traits of decentralization. In fact, Ethereum stems from the technological concepts introduced by Bitcoin. In 2009, the world was mesmerized by the , a cryptocurrency that challenged preconceived notions about the limits of transactions. The inception of Bitcoin commanded the attention of financial institutions, technologists and the public. However, since its debut, the term Bitcoin has also become synonymous with scandals and fraud. Although open currency systems have undergone a few growing pains, their potential continues to expand. Today, new systems have emerged that, like Bitcoin, challenge the conception of centralized control. Ethereum is a decentralized global computer powered by Ethereum nodes. This technology does not require servers, memory or CPU power. 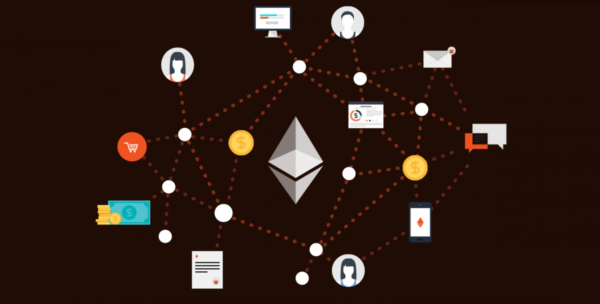 , “Ethereum uses many of the same systems (such as blockchains and peer-to-peer networking) in order to generate a shared-world computing platform that can flexibly but securely run any application users want to code (shared ledgers like Bitcoin included).” Bitcoin opened the world to the possibilities of shared ledgers, and now Ethereum is expanding on that potential. Since Bitcoin’s debut on the world stage, many developers have sought to apply the ideology to new systems similarly underpinned by blockchain technology. However, these iterations failed to impact the tech and financial service communities because they were limited to a few functionalities. The intent of Ethereum is to transcend those limitations by creating a blockchain protocol with its own native programming language, which enables any application to be written on top of it. This structure supports all existing and future applications and lends itself to an environment of constant and immediate development innovation. Another facet that separates Ethereum from Bitcoin is the support Ethereum continues to receive from the financial and technological communities. have pledged their allegiance to Buterin’s . They have recognized the immense power of blockchain technology and cryptocurrency to boost security and efficiency, and are joining the party. What can Ethereum do for your business? It can be difficult to convey a technological structure’s potential in abstract forms. For Ethereum to catch on in the mainstream, individuals—and especially entrepreneurs and startup founders—need to understand the potential value Ethereum presents. Like its predecessor, Bitcoin, Ethereum has instituted a native form of currency: . The driving force behind the development of Ether is to ensure that developers are compensated adequately for their work. Ether inhibits payment for wasteful code, which helps entrepreneurs and small businesses keep developer costs down, but it also ensures that developers receive timely compensation. Ethereum is seeking to create an infrastructure that protects developers, as well as attracts them to organizations that run on Ethereum. The companies that choose Ethereum may very well have an easier time attracting the top development talent. Furthermore, the efficiency of Ethereum has the potential to cut down on operational costs—a possibility that excites business owners across every industry. Like Bitcoin, a future executed by Ethereum payments eliminates any third-party intermediary, thus decreasing transactional fees and increasing the speed and efficiency of making transactions. Many, especially those in financial institutions, view Ethereum’s potential to offer Smart Contracts as its most enticing feature. Smart Contracts are a way of transporting anything of value—money, shares or data—without an intermediary, and Ethereum technology makes this possible. It used to be that you’d have to make a request to receive something of value and wait for an intermediary to facilitate your request, but Smart Contracts are immediate. Another benefit of Smart Contracts is that the rules and regulations associated with the contract are . In fact, according to a , there are suggestions that if Smart Contracts reach their potential, they could remove the need for lawyers and judges, because disputes would be settled automatically. In theory, Smart Contracts cannot be violated. This means that any business running Smart Contracts could potentially save thousands (if not more) on potential legal fees should any disputes with third-party vendors or customers arise. Buterin and Ethereum supporters believe in complete decentralization; they envision a system that puts users in complete control and allows them to innovate in any direction. Through Ethereum, there is the potential that anything from medical histories to financial records to social media data can be decentralized without risking trust. Ethereum is powered by nodes that are immune to crashing, censorship and interference, placing the power in the hands of the people. Through Ethereum, entrepreneurs can develop applications swiftly, and without fear of unnecessary costs and security snafus. For example, Ethereum brings efficient crowdsourcing to life. Using Ethereum, entrepreneurs can create contracts that hold a project contributor’s funds until the contract specifications are met (either by date or fundraising limit) and the contract will automatically release the funds when the criteria have been met. There are no gray areas or human interferences, and this will streamline global collaboration. Furthermore, Ethereum can help budding entrepreneurs build the right teams. An Ethereum-run organization is based on democratic shareholder voting, which means every backer or contractor has access to your latest updates and initiatives based on the contracts you’ve set. Ethereum takes the pain out of managing an organization and answering to shareholders because all of those initiatives are automatically executed within the contract. In 2016, consumers started using Bitcoin in droves. The trend was fueled by widespread consumer desire to employ . As more consumers were adopting Bitcoin, venture capitalists continued to double down in support of cryptocurrency. Bitcoin and Blockchain experts predict more merchants will adopt some form of cryptocurrency in the future, heeding public demands for alternative forms of currency. Both sides of the equation—financial and technological institutions, as well as the public—are ready for a future fueled by decentralized innovation. Ethereum has the potential to not only transform development for the better; it can also help fuel the growth of individual startups. Entrepreneurs can better position themselves for future success by understanding the benefits of conducting a business fueled by Ethereum. If the support of major organizations indicates anything, it’s that all of the buzz surrounding the radical potential of Ethereum is justified. This technology is poised to alter transactions and developments forever.